Morgan Kontz grew up in Indiana but settled on a farm in eastern South Dakota. She'll share stories from the farm each month on the South Dakota Magazine website. The story of how I came to be a farm wife in South Dakota isn’t your typical road to the farm. I am originally from a small town in Indiana, where I grew up with my mom and sister. After my dad married my stepmom, I became the oldest of six. Speaking of my stepmom … she’s Jeanette Lee, the professional pool player also known as “The Black Widow.” As you might imagine, I grew up having experiences that not everyone can say they’ve had. Even though I didn’t grow up on a farm, agriculture has always been a part of my life. When I was younger, I was involved in 4-H and FFA, which led me to pursue a degree in agricultural education. I did most of my schooling at Purdue University, but once I met my farmer I finished at South Dakota State University. My husband and I met on FarmersOnly.com, a website for people who love the rural lifestyle and have a passion for agriculture. We met for the first time face to face on the exit ramp that is now down the road from our home. I lived in South Dakota for a year before I was sure I was ready to do this whole "farm wife" thing. But I love my farmer, and I would do just about anything to be by his side. We have been married over five years and have one adorable little girl. Life is always changing in our home, and we were so excited to have our son in April through in vitro fertilization, which is another story. The road to start our family has definitely not been easy, but we feel so blessed that God chose us to become parents. Before kids, my days used to be filled with helping out on the farm as much as possible — watching gates, running for parts, working cattle, raking or moving hay, cooking, driving grain cart or cleaning water fountains. With kids, I still do a lot of those same things. I just carve out a lot more time for them, and I am thankful to have a wonderful mother-in-law right down the street and two great babysitters always on-call. I have always said one of the best things about my relationship with Jason is our passion for agriculture. It is something we both love and appreciate every day. We are truly living our dream jobs. On my blog, I talk about life on the farm from the perspective of someone who is living it for the first time. My husband can boast coming from a long line of farmers, but mine truly is the story of a First Generation Farm Wife. Morgan Kontz lives on a farm near Colman with her husband, Jason, and two children. 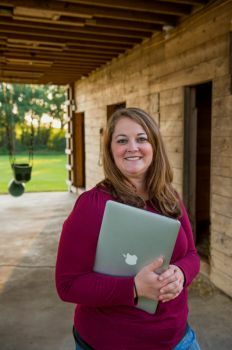 She blogs about her experiences as a first generation South Dakota farm wife and writes a monthly agriculture column for the South Dakota Magazine website. I'm really looking forward to reading your columns here!